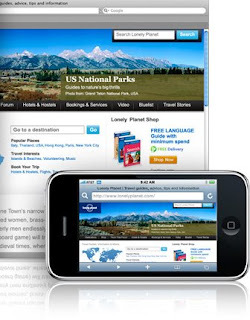 iPhone features Safari — the most advanced web browser ever on a portable device. And with 3G and Wi-Fi, you can browse the Internet really fast. iPhone also syncs your bookmarks from your PC or Mac and has Google and Yahoo! search built in. Wi-Fi. iPhone automatically connects you to the fastest network available. Get a closer look at any web page by zooming in and out with a tap or a pinch. View websites in portrait or landscape mode: Rotate iPhone 90 degrees and the website rotates, too. If you check a website frequently — a favorite newspaper, blog, or sports site — why not create a Home screen icon for it? Make a Web Clip with Safari, and your favorite sites are always just a tap away.